A young Uyghur woman has died while incarcerated in a political “re-education camp” in northwest China’s Xinjiang Uyghur Autonomous Region (XUAR), according to a local official, who said she may have suffered from a heart condition that went untreated by camp authorities. A Uyghur in her early 30s from Onsu (in Chinese, Wensu) county, in the XUAR’s Aksu (Akesu) prefecture, died “at the beginning of the year,” an officer at the Onsu Police Station recently told RFA’s Uyghur Service. The officer, who spoke to RFA on condition of anonymity, said that the young woman was from Village No. 6, or Tuman village, in Onsu’s Jam Bazar township, but could not provide any further information. When asked the name of the woman, a staffer from the Jam Bazar Police Station said he had received a notice “not to give out sensitive information over the phone,” and referred further inquiries on to the local Public Security Bureau. But an officer at the station, who also spoke on condition of anonymity, told RFA her name was Amine Kadir, aged 30 or 31, and that he was at work when it happened. He said Kadir was one of “seven or eight people” from the township who have died while detained in the XUAR’s network of re-education camps, where authorities in the region began jailing and detaining Uyghurs accused of harboring “strong religious views” and “politically incorrect” ideas beginning in April 2017. Her husband “died some time ago,” the officer said, adding that the couple have a child who is three or four years old. RFA also contacted the local Public Security Bureau, where an official said Kadir “may have suffered a heart attack, possibly because she was frightened” about her treatment at the camp. “I heard that she suffered from a heart condition,” he added, when asked what might have caused someone to die at such a relatively young age. According to the official, Kadir’s body was “returned to her parents,” who he said have lodged no complaint in the matter, without elaborating. Sources say detainees face rough treatment at the hands of their overseers in the camps and endure poor diets and unhygienic conditions in the often overcrowded facilities—circumstances that can lead to severe complications for people already vulnerable to health issues. 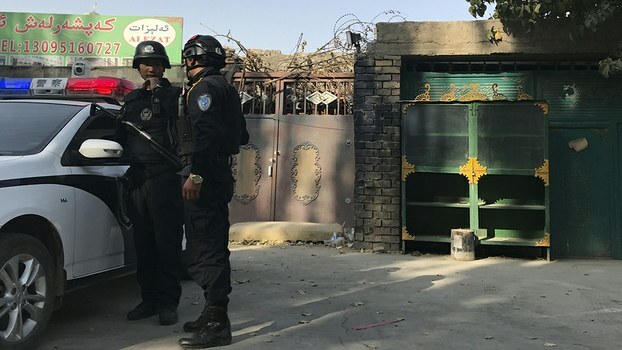 In January, sources told RFA that detention centers in Korla (Kuerle), the seat of central Xinjiang’s Bayin’gholin Mongol (Bayinguoleng Menggu) Autonomous Prefecture, are “completely full” and have been turning detainees away because they could not accommodate them. One source quoted a friend who was admitted to a camp in the area describing cells that had previously held eight people being made to accommodate 14 inmates, who “were not allowed pillows” and “had to lay on their sides because there was not enough room to lay flat,” let alone space to turn over or stretch their legs. While the report from Onsu county doesn’t indicate that beatings or physical torture were the cause of Kadir’s death, information previously provided to RFA suggests that poor conditions in the facilities and disregard for detainees’ medical needs are likely to have played a critical role.